Edition: Published by Goltzius. The set was formerly bound in a red leather album, gold-tooled with gilt edges owned by Simon Watney, Cornbury. The original DAC catalog card states that the album was bound by J. Clarke. The prints are pasted down along the left edge onto wove sheets, with hand-inked borders, that are numbered in sequence on verso from 1 to 20; 1 to 20; and 1 to 12. 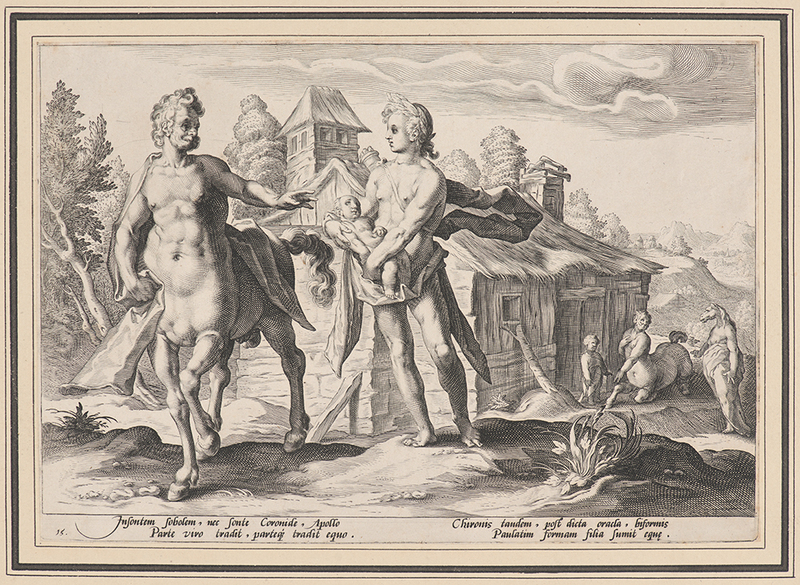 The first series consists of 20 sheets (Bartsch 31 – Bartsch 50), which were engraved in Goltzius’s workshop in 1589. The second series of 20 (Bartsch 51 – Bartsch 70) dates 1590. The third series of 12 (Bartsch 70 – Bartsch 82) was issued in 1615. Bibliography: Bartsch 65 (vol. 2); Illustrated Bartsch 65 (vol. 3, p. 358); for the series, see Hollstein 16–67 (vol. 1, p. 182) and 10–61 (vol. 7, p. 130); see also description attached to original DAC catalog card. Apollo Entrusting Chiron with the Education of Aesculapius, . From Metamorphoses (illustrations for the work by Ovid). Engraving on laid paper. Undescribed first state. Plate: 176 x 254 mm (6.9 x 10 in.). DAC accession number 1968.29.3.35. Purchase funds, 1968. Open Access Image from the Davison Art Center, Wesleyan University (photo: M. Johnston). http://dac-collection.wesleyan.edu/obj1761 is a persistent link to this page with no user-session information.